The first thing to keep in mind when you begin to set up your fishing tackle box is essentially how much time and money you will actually be committing to fishing. Remember, once the bug bites, there is no known cure for fishing and the disease will spread until it works its way into every part of your life. To start out, you will obviously need a tackle box. Tackle boxes come in a myriad of configurations sizes and shapes. To add to your conundrum is the addition of tackle bags. These bags expand your carrying capability to luggage size and will hold literally hundreds of lures. Initially, though, you should select a box which you can first and foremost afford, and one which will not only give you the ability to carry what you need to the lake or pond but also give you the ability to expand and add when you need to. After you have your box and bag figured out, you will need a good pair of long nose pliers with non slip grips. When a fish takes a lure or hook deep you need the long reach of pliers to remove the hook or hooks and save the fish. A pair of scissors is also good to have on hand. From cutting knots to tough braided lines, good scissors will serve you well on more than one occasion. Next for your fishing tackle box are lures. As far as lures go, research what you will need. The point is to assemble a sampling of lures from which you can become both familiar and proficient at using. Resist the temptation to stock up on one of everything especially if it is on sale. There are lures that resemble nothing man has ever seen in nature and some that are spot on matches. Basically, you won�t know which ones catch fish and which won't. The point is to diligently work a few lures initially so that you learn the tricks and secrets of what makes the bait attractive to fish. Your set up should include a few spinner baits and buzz baits. The newer chatter baits are fun to fish and can often produce great catches. Depending on the water you fish, crank baits should be considered, especially the lipless shad and shallow running minnows. Also, mix up the sizes of your baits. Many times bass anglers get caught up with fishing large baits for large fish. This is a mindset that can cost you a lot of fish in the end. 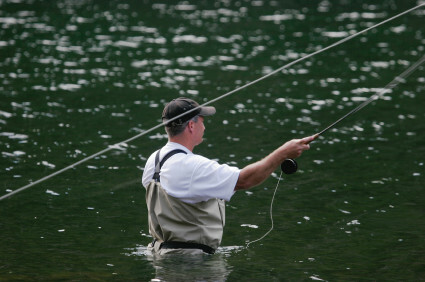 If fish turn finicky, change up the size and or color of what you are throwing. Many times this will do the trick and entice a big one to bite. When setting up your fly fishing tackle box these are the things you will need to worry about most. The most important thing is that you are comfortable with everything and it works for what you are fishing for and the conditions you will be dealing with.